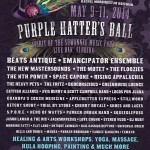 The annual Purples Hatter’s Ball is returning to the wondrous Spirit of the Suwannee Music Park for the eighth time this upcoming May, attracting epic headliners such as Lotus and Nahko & MFTP along with live conscious artwork from Alex and Allyson Grey. These artists are only a small portion of the acts from this year’s stacked lineup, and with so much live music to catch, it is crucial that Suwannee vets and first-timers alike experience some of the up-and-coming artists that will be performing at this year’s PHB. Les Racquet is a Brooklyn based indie-rock band with jazz influences and a head-turning improvisational style. These New Yorkers are a trio of vocal harmonies, blending together into one glorious symphony of voices which is complimented by electric guitar, drums, and of course bass. Composed of members Patrick Carroll (electric guitar, lead vox), Kenny Murphy (bass, vox), and Daniel Malone (drums, vox), Les Racquet constructs a layered sound that consists of a plethora of diverse polyrhythms, representing the differentiated styles of the band members. Mix rock n’ roll improv with indie and add a touch of jazz, and voila – you get LR. This unique style of music is one that is capable of frequently switching from genre to genre all while maintaining an overall smooth, melodious sound. Amongst their previous albums are Les Racquet, Be Water My Friend, and Whale Hail, with the band currently working on a fourth full-length album that will follow up with an album release tour. With so many different influential styles that play into their music, it’s practically impossible to truly grasp the concept of Les Racquet without seeing them perform live, and where better to witness the magic than seeing the guys jam out at the SOSMP during the first weekend of May (p.s the band mentioned in a recent interview with Silence & Sound that their latest productions are “the grooviest thus far” soooo…yeah). Make sure you pack your fuzzy purple hats and dancing shoes, great music and unbeatable company will be provided. 21, currently studying journalism in the Sunshine State. Fueled by bass music, traveling, and writing about those experiences. Previous story Trinidad Carnival 2015: Exploring The Culture of The Home I’ve Been Missing.